Almo Professional A/V’s content creation service Almo CONTENT adds pre-built digital signage content packages during DSE 2018. Many digital signage providers leave content creation to the customer or another provider, leaving opportunities and profits on the table. 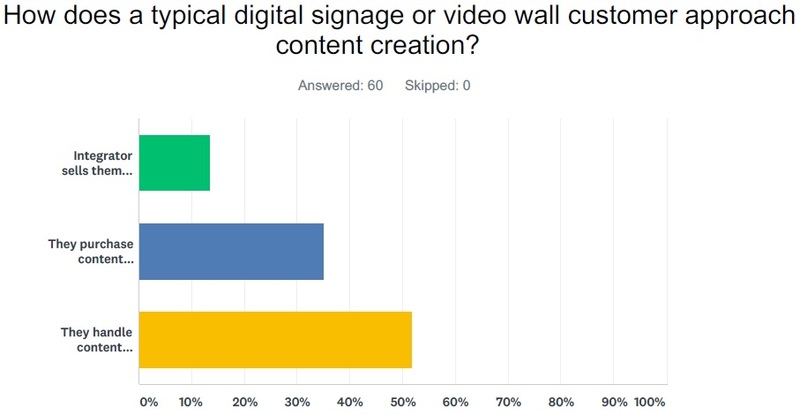 Did you know that only about 50 percent of digital signage customers create their own content? That means about half of your customers need somebody to help them with content creation. If you don’t have a solution for them, well, they’ll just turn to a company that does. And that’s a big reason why Almo Professional A/V launched Almo CONTENT, a digital signage content creation service that integration firm dealers can lean on to, in turn, offer content creation to their customers. The next step in Almo CONTENT was announced at Digital Signage Expo (DSE 2018) where the distributor unveiled a series of pre-built, affordable, application-focused digital signage content packages. During DSE 2018, Almo Pro A/V is showing the new content packages are being shown on its latest digital signage hardware bundles from NEC, Peerless-AV and BrightSign at its booth. In a press release, Almo says it’s the only distributor to offer a complete range of profitable, revenue-enhancing Content Creation Services for its partners. “Our Content Creation Services team includes a group of high caliber designers who work with branding and style guidelines to create eye-catching, effective and functional designs,” says Jay Saret, business development manager for Almo Professional A/V. Learn more about Almo CONTENT during Almo’s 2018 E4 AV Tour. Register here.